Also known as AFF, the Accelerated Freefall Course was developed in the USA to allow anyone to experience, learn in one-on-one training during freefall. 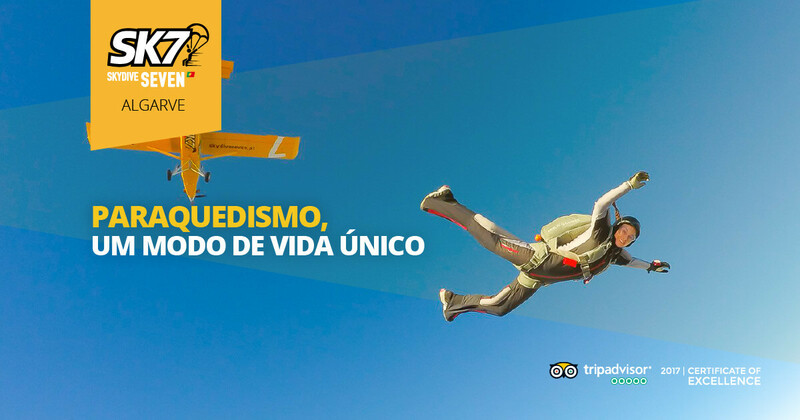 You have a €200 discount if you already have a Tandem Skydiving jump! The Accelerated Freefall Course (commonly referred to as AFF) is a method of skydiving training. It enables you learn to fly your body in freefall maintaining stability and control, maintain the height awareness to open your parachute at the correct altitude, and fly and land your parachute safely and accurately. AFF has largely replaced the old static line method of training whereby the student exits the plane at a low altitude, and has a line connected to the plane open their parachute for them. We do the Accelerated Freefall Course whenever you want. We have professional team always available. Skydive Seven is open every day, just contact us. You should make the appointment a few days in advance, there are some formal procedures to deal with, such as: Accommodation; Sports Medical Exam; Mandatory Sport Insurance in the Portuguese Parachuting Federation, etc.